IMA Active’s coating pan for film and sugar coating processes installed at the GlaxoSmithKline site in Mayenne, France. As a science-led global healthcare company, GlaxoSmithKline is specialized in research, development and production of innovative products in three primary areas: Pharmaceuticals, Vaccines, and Consumer Healthcare. GSK has a heritage dating back 300 years. The company was formed with the merger of Glaxo Wellcome and SmithKline Beecham in 2000. Today GSK employs nearly 100,000 people around the world covering 150 countries and has an annual turnover of £27.9bn (2016). Additionally, GSK has a network of 86 manufacturing sites in 36 countries and large R&D centers in the UK, USA, Spain, Belgium and China. GSK is the largest vaccines company (833m vaccines produced in 2016) and is a leading global company tackling respiratory illnesses, infectious diseases and HIV. Beyond the numbers, GSK has vision. Research with the special aim to help people do more, feel better and live longer. Close collaboration with doctors and other healthcare professionals is essential for this purpose. The collaboration is solidified by means of contracts and important investments in scientific and technical excellence (£3.6bn R&D investment in 2016). Pursuing the aim to reduce environmental impact while increasing efficiency, GlaxoSmithKline has equipped its plant in Mayenne (France) with Perfima, IMA Active’s coating pan for film and sugar processes. Perfima is a flexible and reliable machine providing the highest efficiency in the field of automatic coating equipment. Two models are available: Perfima for tablet film and sugar coating and Perfima Edge for pellet, microtablet, and tablet processing. Also suitable for containment installations, Perfima guarantees maximum operator protection while working with Highly Active Pharmaceutical Ingredients (HAPI). The shape of the pan combined with the mixing baffles positioned on the central section of the drum ensures a perfect and uniform mixing of the cores. The mixing capability is maintained regardless of minimum or maximum product batch size, allowing a wide range of batch sizes to be processed in the same machine. Location and dimensions of the outlet air duct are designed to guarantee a good and uniform drying of the product while saving energy. Perfima spray guns feature an Anti-Bearding-Cap (ABC) system avoiding gun clogging during coating operations. Both film and sugar spray guns can be easily fitted on the sliding support arm and can be manually or automatically positioned and adjusted. The sliding arm can be removed from the front door allowing gun changing, calibration/adjustment with fast and safe cleaning. The spray system and guns are the result of combining highly advanced technologies and proven designs to ensure easy maintenance, simple inspection operations and quick changeover from one product to another. All parts of the machine in contact with the product are completely isolated: the entire coating process can be achieved without contamination of the external environment. In addition, Perfima is equipped with a completely automatic Clean in Place system. Cleaning nozzles and spray balls cover all machine surfaces to be cleaned: the cleaning cycle can start immediately after the coating process without the need to install additional devices. The aim of the trials developed in cooperation with the customer was to test the efficiency of the machines thermoregulation during the spray time of a specific coating process. Achieving a proper stabilization of core temperature and the balance of thermodynamic conditions was very important for the customer since the product intended to be processed in the coater was very sensitive to humidity (oblong shaped antibiotic tablets). Coating was performed using a standard HPMC based Opadry white and blue color prepared with 15% solids content. Preliminary tests were run to determine the optimal conditions first in a pilot coater Perfima Lab (30 L drum) by using the following parameters and achieving a 3.5% weight gain applied on 760 mg placebo tablets. Results were positive in terms of coating quality, process time and more important, final LOD. Starting LOD was measured 1.6% at 105°C constant weight by thermo balance before preheating and at the end of the final cooling resulted decreased to 1.19 – 1.22% in all the trials performed. 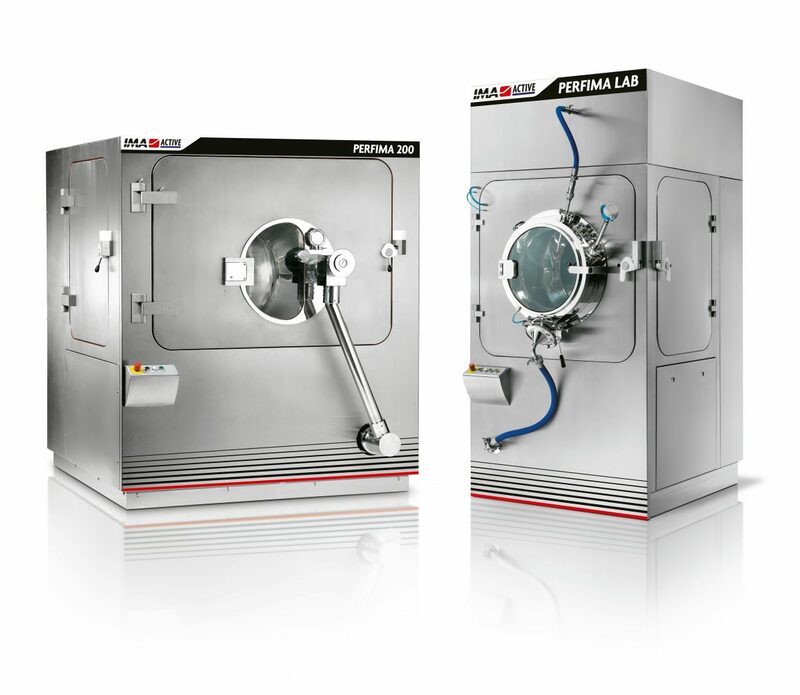 After the interesting results in the small coater, the process was challenged and monitored in the production scale machine model Perfima 200 (250 L drum). Process went smoothly and successfully with the following parameters using both Opadry white and blue. Due to the inlet air handling unit equipped with a dehumidification system on the production sized coater, it was possible to reduce the humidity content of the cores from 1.5% to 0.9% during the coating process. Interesting was the possibility to monitor the trend of the cores temperature during all the coating steps: due to auto-regulation of inlet air temperature and the spray rate delivered by the system, as the spray rate was increased in the automatic recipe the air temperature was adjusted to keep the tablet conditions close to the desired set point (44°C). When the equipment was installed at the GSK site, everything was repeated on the active tablets with good results demonstrating once again the importance of running preliminary trials before installation and validation of the equipment.